The Guardian "“A play of importance, power and pathos which should concern us all.”"
Germany 1934. 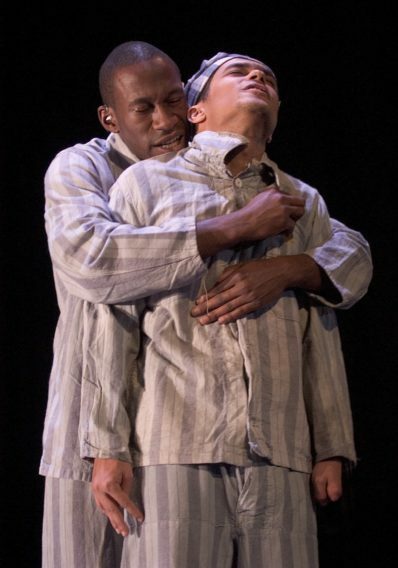 Amid awakening fascist terror and persecution of homosexuals, a surprising love story unfolds. Travelling from the intoxicating world of Berlin’s gay nightclubs to the bleak horror of Dachau, Bent is a harrowing, historical tale of love, hate and prejudice. Featuring actors diverse in impairment and ethnicity presents a stark reminder of the human obliteration suffered under Hitler’s regime. Director Jenny Sealey applies her unique approach to seamlessly fuse audio description, sign language, music and physicality to create a shattering performance.